Photos of a capsule hotel in the North Chinese city of Taiyuan have been causing a stir on social media. The concept for cheap pod-like rooms originated in Japan. But there's much more on offer than meets the eye. Measuring just 1.2 meters high and the width of a single bed, rooms at the Taiyuan Shangjian Capsule Hotel are not the most luxurious. But with all the amenities of modern accommodations, including free Wi-Fi, a laptop desk and TV -- and at a cost of just 50 to 60 yuan per night -- these capsule rooms are also attracting plenty of interest. For people in China, the layout here may seem a bit like a college dormitory. Some people may feel there's not enough space. But many young customers say they feel comfortable and safe, and they can save a lot of money. An Fangfang has been on a business trip in Taiyuan for the past week. The 200-square-meter capsule hotel located within a residential complex in downtown Taiyuan offered everything she was looking for -- and more. "I feel safe here. People living here are like a family," An said. Other guests agree that the capsule offers an atmosphere unlike most other hotels. "I used to live in normal hotels where I felt lonely and bored. But it's quite fun in this capsule hotel with many others. We often play chess or cards together," Capsule hotel guest Ren Kun said. Although it only has 20 capsule rooms available, nearly 200 guests have stayed in the hotel since it opened a month ago. The head of the hotel says nearly all the customers have been under the age of 30. And many have left with new friends. "People from different places often talk to each other in our hotel. 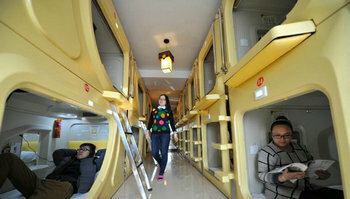 We hope to develop a sense of family here," Shao Shuai, manager of Taiyuan Shangjian Capsule Hotel, said.